At Jiwa Damai we place a high value on sustainable food practices and organically grown produce. We grow and eat a fair amount from our permaculture garden. Astri, our very talented Balinese cook, prepares food with great care and love. We eat mostly traditional Balinese dishes here. In this blog, we want to share some of Astri’s amazing recipes with you. 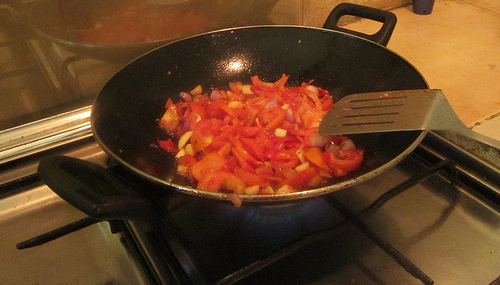 We start with a very important dish in the Balinese cuisine - Sambal. Peel and chop garlic, red onion, tomatoes and chilies. Combine in medium mixing bowl. Heat skillet with around 3 tablespoons of oil. Add ingredients and allow to simmer. Stir occasionally, reducing the tomatoes down. Add the teaspoon of salt, continue to reduce until tomatoes are soft and juicy. Remove from heat, add veggie stock and sugar. Put ingredients into blender, run until smooth. Most of the time at Jiwa Damai, we eat sambal with tempe and rice. It makes a delicious addition, however, to cooked vegetables or eggs. Note: There are many variations of sambal in Indonesia, used both as a sauce, a dip and a regular table condiment. Variations include those with Kaffir lime, peanuts, or shrimp paste.